Iontophoresis is a safe medical procedure in which very mild electrical currents are passed through the skin. If you are one of the millions of Americans suffering from excessive sweating problems, this could be the solution you’ve been looking for. During the iontophoresis treatment, the affected part of your body is put in water and then given light electric shocks through an iontophoresis machine. These are able to temporarily block your sweat glands, though they made need around six to 10 treatments to do so. The procedure is not powerful enough to give you an actual shock. Most patients simply report a tingling feeling around the area being affected. Where Does Iontophoresis Treatment Take Place? The procedure can be done right in the doctor’s office. Your doctor will have you submerge the desired body part into a basin of water and then they will turn on the iontophoresis device. To help control excessive sweating, sessions usually last between 25 to 45 minutes. You are not expected to see results right away and may need to reschedule more appointments to continue the treatment. Your doctor should be able to work with your schedule. Iontophoresis is a very safe procedure. Any side effects are mild and don’t last long. The most common one is the skin feeling dry. Your skin may also blister, peel, or become irritated from the shocks, but this can largely be dealt with using moisturizer. Iontophoresis treatment has been reported to be very effective in helping excessive sweating. After just a few sessions, many patients reported their sweating had decreased over time. Because of this, they needed to go in for treatments less often. Though mostly used to treat excessive sweating iontophoresis treatment can also be used to help treat sports injuries. The only difference is some form of anti-inflammatory medicine is added to the water basin before treatment, so as not to further irritate the injury. Iontophoresis treatment is still relatively new in the United States. However, its effectiveness and ease are quickly allowing it to gain a reputation as a viable treatment for excessive sweating. If you struggle with sweating too much, talk to your doctor about iontophoresis. Hyperhidrosis, more commonly known as excessive sweating, is a problem that faces many people around the world. Those who suffer from it usually have another family member who has it as well, up to 30 to 50% of the time, implying hyperhidrosis may be genetic. Many people struggle to control excessive sweating, leading to stress and low confidence on account of their condition. The first step in helping excessive sweating problems is to know what causes them. Here are six of the most common causes of hyperhidrosis. This is a condition where there exists too many thyroid hormones in a person’s body. This condition can have a wide variety of symptoms that vary from person to person. Luckily, there are reliable procedures in place to diagnose and treat this condition, leading to help with excessive sweating. For reasons unknown to doctors, some cancers can cause excessive sweating. Some believe it is because the body is trying to fight off the cancer, thus causing exertion. Those whose cancer had progressed significantly are likely to experience excessive sweating. Anxiety disorders have been known to cause hyperhidrosis. These disorders raise the body temperature, thus leading to a great need for sweat to form. Some medications used to treat psychiatric problems also cause excessive sweating. Talk to your doctor about learning how to control excessive sweating caused by medication. Some medication may have a side effect of excessive sweating. Not all who take that particular medication may experience it. If this happens to you, continue to take the medication as prescribed and talk with your doctor about the issue. Diabetes, hypoglycemia and other glucose disorders can cause excessive sweating to occur. It is often a symptom indicating low glucose levels in the body. The first step to control excessive sweating is knowing what you’re looking for. Other conditions can cause hyperhidrosis, but the above six conditions are the most common. Talk to your doctor if you are experiencing excessive sweating problems. Usually seen as dirty, gross or just plain unclean, this essential part of your body’s chemistry usually has a lot of misinformation surrounding it. This becomes even more of an issue for people suffering from hyperhidrosis, otherwise known as an excessive sweating problem. Today, let’s discuss some common myths surrounding sweating and see why they’re not actually all that true. Fact: Sweat is odorless. The cause of the smell is actually bacteria on our body that break down lipids and proteins from our sweat glands, thus creating the smell. Fact: Oils from the skin, not sweat, becoming clogged in sebum glands is what causes sweat. However, some tight clothing can cause the oil and bacteria to seep into the sebum glands, causing acne. Fact: Again, this has more to do with the oils and bacteria on your skin, and not really the sweat itself. The mixture of these things is what causes the yellow-tinted stains on the clothing. Those seeking help with excessive sweating or iontophoresis treatment can find using darker fabric can hide stains better. Fact: That’s the liver’s job. When trying to sweat out toxins, what you’re actually losing is salt, protein and most importantly, water. Fact:Sweating means loss of water. Therefore, any weight you may notice yourself losing from sweating, alone, is nothing more than water weight. This is only temporary, as water weight will come back when you drink something. Fact:Some people are under the misconception that wearing antiperspirant while working out is dangerous. In fact, it’s very safe and healthy. It will lower sweat in your armpits and doesn’t trap in heat like some people are led to believe. Fact:While sweating can be a small indicator that you’re working hard, a lot of other factors can contribute to the amount you sweat. Like your clothes, the temperature of the room you’re in, how in shape you are or just genetics. People have around four million sweat glands working to keep the body cool, and they are subject to a lot of environmental changes. To get a better indication of how well your workout is going, monitor calories lost and heart rate instead. Sweating is still somewhat of a taboo thing in today’s society. It can be excessively difficult and embarrassing for people trying to control excessive sweating in their bodies or are looking into iontophoresis treatments. However, with these seven myths debunked about sweating, then hopefully those looking into treatment options may feel more comfortable in doing so. There is a large disconnect across the nation when it comes to sweating. Many sweat sufferers are embarrassed to bring it up to their doctors or are too nervous to even ask questions about what they’re experiencing. 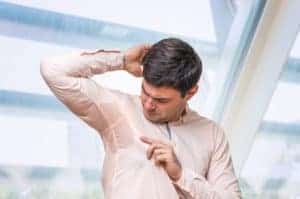 However, excessive sweating is all too common, and about eight million Americans suffer from hyperhidrosis, which means they sweat four to five times as much as the average individual. If you are looking to control excessive sweating, it is important that you actually understand what hyperhidrosis entails. Here are some common myths about sweating that will hopefully clear up any questions you may have. Myth: Sweating is unnatural and means you are dirty. This is completely untrue! Sweating is the body’s natural way of cooling you down. While it does release toxins, sweating does not mean in any way shape or form that you are dirty or unclean. Myth: Deodorant can stop sweating in its tracks. False. Many commercials explain that deodorant is a great way to reduce sweating, but this is just a false claim. In reality, deodorants are meant to mask the scent of body odor, not stop the sweat from being produced. If you need to stop excessive body sweating, make sure to choose an antiperspirant that blocks sweat glands. If common antiperspirants fail to stop the sweat, then talk to your doctor about a prescription for an iontophoresis machine. Myth: If I have hyperhidrosis, prescription medications are my only option. Completely false! There is always the option of an iontophoresis machine, which is a simple process extremely popular in Europe. All you need to do is place your hands in water, then the machine will release negative ions that pass over your skin and temporarily close your sweat ducts. Myth: You can control sweating by wearing lighter clothes. De-layering can give you a temporary solution, yes. But in the long run, serious sweating will continue to happen even without a warm temperature or physical exertion. Light clothes can help your body to feel cool for a moment, but in the long term fight against hyperhidrosis, it will not work. If you have any additional questions about sweating or think you could benefit from an iontophoresis machine, please contact our professionals today. You could be one delivery away from stopping your sweat in its tracks once and for all!